Alternatrip Presents: Pop Up The Volume! Why you should go: Noise pop, indie pop, dream pop, pogi pop, pseudo-pop, folk pop, nerd pop, soda pop. 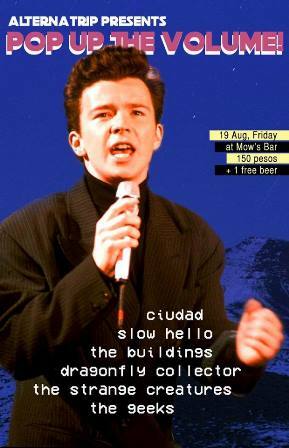 "Pop Up the Volume" returns with a line-up of your favorite pop bands featuring Ciudad, Dragonfly Collector, Slow Hello, The Buildings, The Strange Creatures, and The Geeks Philippines. Other details: Gig starts 9 p.m. P150 gets you in, with a free beer!